^ Mantell, Ruth. 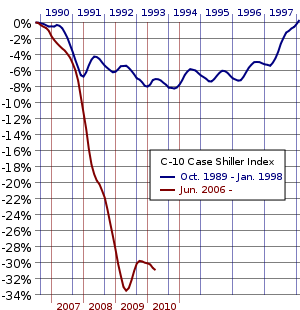 "Home prices off record 18% in past year, Case-Schiller says". www.marketwatch.com. Retrieved 2009-04-29. ^ a b c "In Washington, big business and big money are writing the rules on trade ...". Bill Moyers Journal. 2007-06-29. PBS. ^ a b Bajaj, Vikas (July 25, 2007). 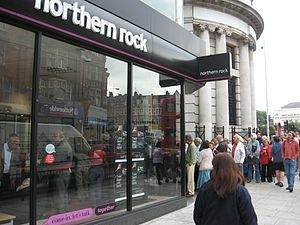 "Lender Sees Mortgage Woes for 'Good' Risks". The New York Times. Retrieved 2010-05-26. ^ Evans-Pritchard, Ambrose (March 23, 2006). "No mercy now, no bail-out later". The Daily Telegraph. London. Retrieved 2010-05-26. [T]he American housing boom is now the mother of all bubbles—in sheer volume, if not in degrees of speculative madness. ^ a b c d Poirier, John (March 19, 2007). 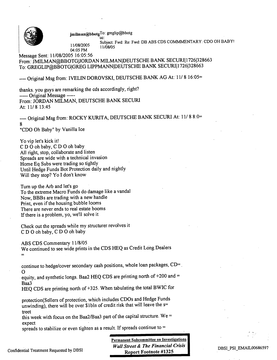 "Top five US subprime lenders asked to testify-Dodd". Reuters. Retrieved 2008-03-17. 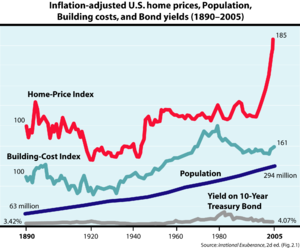 ^ "Is A Housing Bubble About To Burst?". BusinessWeek. July 19, 2004. Archived from the original on March 4, 2008. Retrieved 2008-03-17. ^ a b Tully, Shawn (May 5, 2006). "Welcome to the Dead Zone". Fortune. Retrieved 2008-03-17. This article classified several U.S. real-estate regions as "Dead Zones", "Danger Zones", and "Safe Havens". ^ a b Nancy Trejos (April 24, 2007). 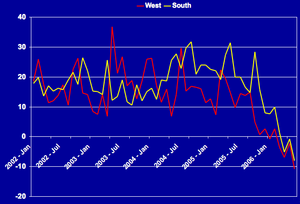 "Existing-Home Sales Fall Steeply". The Washington Post. Retrieved 2008-03-17. 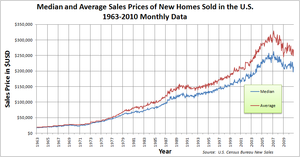 ^ "Median and Average Sales Prices of New Homes Sold in United States" (PDF). Census.gov. Retrieved 2014-05-30. ^ a b Christie, Les (August 14, 2007). "California cities fill top 10 foreclosure list". CNNMoney.com. Retrieved 2010-05-26. ^ "Home prices tumble as consumer confidence sinks". Reuters. November 27, 2007. Retrieved 2008-03-17. ^ Lynch, Sharon (October 2, 2008). "Metro U.S. Home Prices Fall on Higher Foreclosures". Bloomberg. Retrieved 2008-10-10. ^ "Bureau of Economic Analysis GDP estimate, Q2 2007" (PDF) (Press release). July 27, 2007. Retrieved 2008-03-24. ^ "Chicago Fed index indicates recession has probably begun". Forbes. Thomson Financial. March 24, 2008. Archived from the original on May 14, 2008. Retrieved 2008-03-24. ^ Searjeant, Graham (August 27, 2005). "US heading for house price crash, Greenspan tells buyers". The Times. London. Retrieved 2010-05-26. 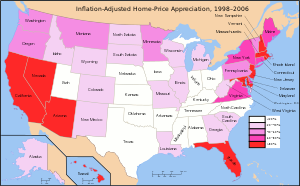 Alan Greenspan, the United States's central banker, warned American homebuyers that they risk a crash if they continue to drive property prices higher ... On traditional tests, about a third of U.S. local homes markets are now markedly overpriced. ^ a b Creswell, Julie; Bajaj, Vikas (June 23, 2007). "$3.2 Billion Move by Bear Stearns to Rescue Fund". The New York Times. Retrieved 2010-05-26. ^ Kanter, James; Werdigier, Julia (August 9, 2007). "Big French Bank Suspends Funds". The New York Times. Retrieved 2010-05-26. ^ On October 15, 2008, Anthony Faiola, Ellen Nakashima and Jill Drew wrote a lengthy article in the Washington Post titled, "What Went Wrong." See http://www.washingtonpost.com/wp-dyn/content/article/2008/10/14/AR2008101403343_5.html?hpid=topnews&sid=ST2008101403344&s_pos=. In their investigation, the authors claim that Greenspan vehemently opposed any regulation of financial instruments known as derivatives. They further claim that Greenspan actively sought to undermine the office of the Commodity Futures Trading Commission, specifically under the leadership of Brooksley E. Born, when the Commission sought to initiate the regulation of derivatives. Ultimately, it was the collapse of a specific kind of derivative, the mortgage-backed security, that triggered the economic crisis of 2008. Fackler, Martin (December 25, 2005). "Take It From Japan: Bubbles Hurt". The New York Times. Retrieved 2010-05-26.